In 1919 the Meyer family moved to the Walnut Avenue Ranch adjacent to Stony Creek near Orland, California. It was a dairy, with many of the animals and crops typical of a family farm. However, during the Depression it became necessary to develop new sources of income. Fortunately, there were plentiful California Black Walnut trees on the property, planted by the Meyer boys (all six of them.) 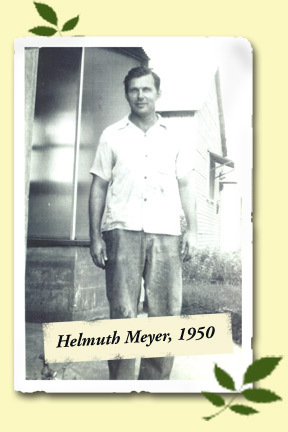 In 1934 nineteen year old Helmuth Meyer found that he could sell the nut meats to a Chico facility and started cracking the black walnuts with barley rollers. The nut meats were then laboriously separated from the shells by hand. In 1935 Helmuth invented a device that mechanically separated the nuts from the shells, an important and sought-after accomplishment. In 1938 he built a large black walnut cracker (which we still use) that cracks the nuts with large steel wheels. Cracking and processing black walnuts was becoming an industry, with three separate processors in Chico alone, and more in other parts of the Central Valley. The Depression years made it difficult to act, but by 1942 Helmuth built a plant in Chico for full-time shelling of black walnuts. California Black Walnuts are the only nut crop that is not farmed in orchards, but is harvested from trees found in landscaped areas and in nature along streams. Hand gathering of the nuts is labor intensive, but provided welcome pocket money for school kids. A drop in harvesting by the public, and the cutting of black walnut trees for their valuable lumber over the years resulted in a steady decline of the nuts themselves. Consequently, in the 1950’s the business expanded to the shelling of English walnuts and almonds, then the complete processing of nut meats, including roasting and packing. Throughout the years, Helmuth personally built all of his warehouses and processing buildings, and much of his machinery, sometimes with the help of his three sons. His bulk and vacuum packed nut products were shipped to bakeries, supermarkets, ice cream factories, and distributors nationwide. In 1975 Helmuth sold all of his Chico operations and rebuilt (now with his son, Melvin, as partner) the business at the Orland ranch where there was room to expand, using the historic name for the property – Walnut Avenue Ranch. Mindful of the new health food fads at the time, they began making very popular and healthful natural confections, using seven of their own recipes with dried fruits, nuts, seeds, and natural sweeteners. They continued, however, with shelling and processing walnuts. Almonds soon followed, and they found their niche in custom roasting and flavoring, using a method that resulted in superior flavor. They soon began producing all natural nut butters, roasted cashews, mixed nuts, and trail mixes, and packing and shipping to stores under their own and private labels. Having moved back to his childhood home, Helmuth restored all the historic structures on the ranch that were still standing – the house, barn, windmill and pump house. 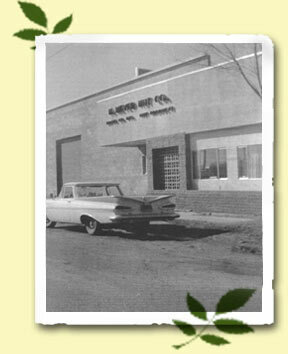 His next project – in 1997 Helmuth built a candy factory next to the nut factory. Why not! Being involved in making chocolates was something he always wanted to do. In 1998 he and daughter, Sherry, opened a retail store with tasting room in the candy factory, which now produces traditional candies including chocolates and brittles. After 75 years, Walnut Avenue Ranch still remains in the family.